Less famous than neighboring Como, Lake Garda is the largest, and some think the most beautiful lake in Northern Italy. The diversity of activities makes this a popular holiday destination. Come for the sailing, windsurfing, mountain biking, hiking, swimming and of course just relaxing. After listening to our good friend rave about her recent visit: the setting, the food, and the hotels—we’re putting it on our list of places to go. Lake Garda is between Milan and Venice, and is easy to reach by train (or car) from either destination. From Milan the train is approximately one hour, with Venice closer to two - perfect for combining with a longer trip. Into Shakespeare? Visit the lovely town of Verona, the setting for Romeo and Juliet. Approximately 15-20 minutes from the southern shore of Garda, it’s an easy day trip. It gets windy on the Northern end of the lake. Riva del Garda is known as Europe’s windsurfing capi. I have a very good friend who lives on Lake Garda in a small town called Desenzano del Garda. The lake is Caribbean blue and crystal clear. It is absolutely beautiful! Skip Como and head straight to Garda. Sleep: Unless you also have a friend to stay with, I’d suggest you make the town of Garnagno, north of Desenzano, your base. The Villa Feltrinelli is a turn of the century private home converted into a hotel, it was once the summer residence of one of Italy’s wealthiest families. The beautiful pool and garden are set right on the lake. We had lunch there one day and although lavish it’s relaxed, and not at all stuffy. I’d be very happy to stay here. Local Interest: A must stop when visiting Garda is the town of Sermione, Lake Garda’s prettiest village. This small medieval town is on a peninsula just east of Desenzano. You have to park and cross the bridge on foot to enter the town. It’s a nice walk to the point, where there are some interesting roman ruins and a beautiful view of the entire lake. Eat: This is Italy so naturally there are lots of great options. Chef Gionata Bignotti has a one star Michelin restaurant in Sermione called Rucola. He’s known for his creative Italian dishes. On the way out of town you have to stop and have pizza at Malibu. This is my friend’s weekly pizza spot. Drive up the west side of the lake, and stop in Salo’ for the best gelato at La Casa del Dolce. Continue north to Gardone Riviera and eat at Villa Carne al Fuoco, Lido 84 or Villa Fiordaliso, all are excellent. 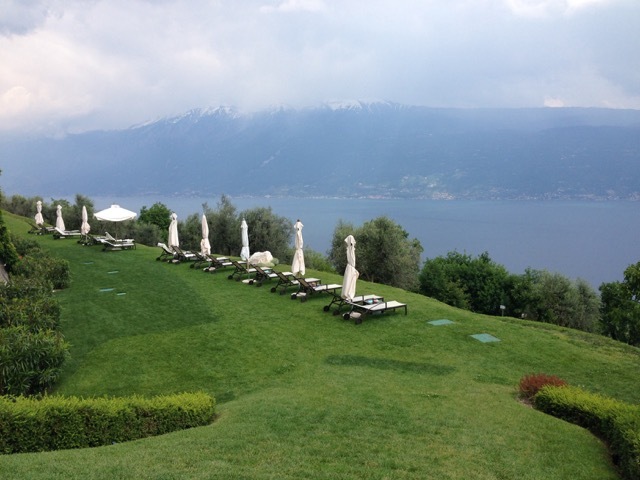 Spa: We spent a day at Lefay Spa, located way up high above the lake in Gargnano. (It’s on the Western shore about an hour away from Desenzano) I have never been to such a beautiful spa in such a spectacular spot! We spent the day, but with two swimming pools, five meditation gardens, 25 acres to hike and bike, and a host of wellness programs I could be tempted to go back for a longer stay! Shop: No trip would be complete without a stop at Lucca Roda’s factory shop in Desenzano on Via Mantova 4.He primarily makes high end men’s clothes, but also designs beautiful women’s scarves. The prices here are much lower than at his retail shop in Milan. I Loved It: This is a beautiful part of Italy, and is worth it’s own trip.